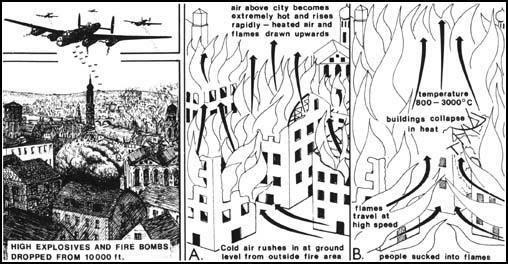 In 1941 Charles Portal of the British Air Staff advocated that entire cities and towns should be bombed. Portal claimed that this would quickly bring about the collapse of civilian morale in Germany. Air Marshall Arthur Harris agreed and when he became head of RAF Bomber Command in February 1942, he introduced a policy of area bombing (known in Germany as terror bombing) where entire cities and towns were targeted. One tactic used by the Royal Air Force and the United States Army Air Force was the creation of firestorms. This was achieved by dropping incendiary bombs, filled with highly combustible chemicals such as magnesium, phosphorus or petroleum jelly (napalm), in clusters over a specific target. After the area caught fire, the air above the bombed area, become extremely hot and rose rapidly. Cold air then rushed in at ground level from the outside and people were sucked into the fire. The most notable examples of this tactic being used was in Hamburg (August, 1943), Dresden (February, 1945) and Tokyo (March 1945). From a firestorm there is small chance of escape. Certain conditions had to be present, such as the concentration of high buildings and a concentration of bombers in time and space, which produced so many huge fires so rapidly and so close together that the air above them super-heated and drew the flames out explosively. On the enormous scale of a large city, the roaring rush of heated air upwards developed the characteristics and power of a tornado, strong enough to pick up people and such them into the flames. (20-30 centigrades). In a built-up area the suction could not follow its shortest course, but the overheated air stormed through the street with immense force taking along not only sparks but burning timber and roof beams, so spreading the fire farther and farther, developing in a short time into a fire typhoon such as was never before witnessed, against which every human resistance was quite useless. (5) Wilhelm Johnen, was a Luftwaffe pilot who attempted to protect Hamburg in August 1943.
following nights, until 3rd August 1943, the British returned and dropped on the almost defenceless city about 3,000 block-busters, 1,200 land-mines, 25,000 H.E., 3,000,000 incendiaries, 80,000 phosphorus bombs and 500 phosphorus drums; 40,000 men were killed, a further 40,000 wounded and 900,000 were homeless or missing. This devastating raid on Hamburg had the effect of a red light on all the big German cities and on the whole German people. Everyone felt it was now high time to capitulate before any further damage was done. But the High Command insisted that the 'total war' should proceed. Hamburg was merely the first link in a long chain of pitiless air attacks made by the Allies on the German civilian population. 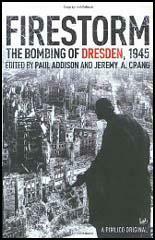 (6) Margaret Freyer was living in Dresden during the firestorm created on 13th February, 1945. The firestorm is incredible, there are calls for help and screams from somewhere but all around is one single inferno. Suddenly, I saw people again, right in front of me. They scream and gesticulate with their hands, and then - to my utter horror and amazement - I see how one after the other they simply seem to let themselves drop to the ground. (Today I know that these unfortunate people were the victims of lack of oxygen). They fainted and then burnt to cinders. (7) Otto Sailer-Jackson was a keeper at Dresden Zoo on 13th February, 1945. The elephants gave spine-chilling screams. The baby cow elephant was lying in the narrow barrier-moat on her back, her legs up in the sky. She had suffered severe stomach injuries and could not move. A 90 cwt. cow elephant had been flung clear across the barrier moat and the fence by some terrific blast wave, and stood there trembling. I had no choice but to leave these animals to their fate. I had known for one hour now that the most difficult task could ever bring was facing me. "Lehmann, we must get to the carnivores," I called. We did what we had to do, but it broke my heart. (8) Members of the RAF bombing crews became increasingly concerned about the morality of creating firestorms. 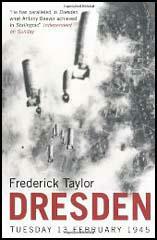 Roy Akehurst was a wireless operator who took part in the raid on Dresden. The radio tells us that the war is over but from where I sit it looks suspiciously like a rumor. A few minutes ago - at 1:32 a.m. - we fire-bombed Kumagaya, a small industrial city behind Tokyo near the northern edge of Kanto Plain. Peace was not official for the Japanese either, for they shot right back at us. Other fires are raging at Isesaki, another city on the plain, and as we skirt the eastern base of Fujiyama Lieutenant General James Doolittle's B-29s, flying their first mission from the 8th Air Force base on Okinawa, arrive to put the finishing touches on Kumagaya. I rode in the City of Saco (Maine), piloted by First Lieutenant Theodore J. Lamb, twenty-eight, of 103-21 Lefferts Blvd, Richmond Hill, Queens, New York. Like all the rest. Lamb's crew showed the strain of the last five days of the uneasy "truce" that kept Superforts grounded. They had thought the war was over. They had passed most of the time around radios, hoping the President would make it official. They did not see that it made much difference whether Emperor Hirohito stayed in power. Had our propaganda not portrayed him as a puppet? Well, then, we could use him just as the war lords had done. The 314th Bombardment Wing was alerted yesterday morning. At 2:20 p.m., pilots, bombardiers, navigators, radio men, and gunners trooped into the briefing shack to learn that the war was still on. Their target was to be apathetically small city of little obvious importance, and their commanding officer. Colonel Carl R. Storrie, of Denton, Texas, was at pains to convince them why Kumagaya, with a population of 49,000, had to be burned to the ground. There were component parts factories of the Nakajima aircraft industry in the town, he said. Moreover, it was an important railway center. No one wants to die in the closing moments of a war. The wing chaplain. Captain Benjamin Schmidke, of Springfield, Mo., asked the men to pray, and then the group commander jumped on the platform and cried: "This is the last mission. Make it the best we ever ran." Colonel Storrie was to ride in one of the lead planes, dropping four 1,000-pound high explosives in the hope that the defenders of the town would take cover in buildings or underground and then be trapped by a box pattern of fire bombs to be dumped by eighty planes directly behind. "We've got 'em on the one yard line. Let's push the ball over," the colonel exhorted his men. "This should be the final knockout blow of the war. Put your bombs on the target so that tomorrow the world will have peace." at two hundred knots, and the bombs simply scattered all over Japan. We were hitting nothing and losing planes.